Tuscan Village is a resort-style, active adult community in Lakeway, Texas. This Italian-inspired neighborhood caters to both socially minded and physically active residents looking for low-maintenance living. Tuscan Village offers its residents a beautiful clubhouse with both indoor and outdoor amenities. Many retirees are lured to Tuscan Village because of the newly constructed homes that offer modern floor plans and finishes favored by today's active adults. There are a variety of housing options with nearly 200 villas and townhomes available. With maintenance out of the way, residents have more time to meet new neighbors and make lifelong friends who share the same interests and hobbies. Tuscan Village features many amenities to keep its residents happy, healthy and busy. The 9,000 square-foot clubhouse is the hub for all social and physical activities. Staying in shape is made easy with the state-of-the-art fitness center, aerobics and yoga studio, and an indoor pool. The clubhouse also includes social rooms and a multi-purpose room. Outside, residents can enjoy the stunning landscape while taking a stroll on the walking and biking trails. The two-acre Central Park is the perfect place to bring your dog or enjoy a game of pickleball or bocce ball with friends and neighbors. Residents of Tuscan Village also have an on-site 11,000 square-foot public library. Here, one can partake in book discussions, listen to guest speakers or simply relax with a good novel. Legend Communities began construction of Tuscan Village in 2012 with plans to build 196 homes. Homebuyers can choose from both townhomes and villas. There are five townhome floor plans that range in size from 1,294 to 1,790 square feet. Townhomes feature two bedrooms, two bathrooms and a one or two-car garage. Most townhomes also offer a den and an outdoor patio. For those looking for a little more living space the villas are the perfect option. There are 13 villa floor plans offered that range in size from 1,663 to 3,219 square feet. Villas feature two to four bedrooms, two to three-and-a-half bathrooms, and a two-car garage. Most homes also feature a den and an outdoor patio. Each home is thoughtfully designed with beautiful stone and stucco exteriors. Homeowners can choose from eleven designer paint color choices, seven lighting packages, and 13 stain color options for cabinets. Each new home will have a beautiful foyer, handicap accessible doorways throughout, and ceiling fans in the great room, master bedroom and one interior location of the buyer's choice. The monthly homeowners association fee allows residents to live in a resort-style setting with low-maintenance homes. The fee covers landscaping, road repair and maintenance, exterior pest control, clubhouse and amenities maintenance, concierge services, and a social membership to Rough Hollow Yacht Club. Tuscan Village offers daily activities and a multitude of diverse events geared towards forming friendships between neighbors and enhancing the community spirit. Residents can join in a yoga class, relax with a book or play cards with neighbors. There are also several groups to join that range from bocce ball to the memoir-writing group. Whatever your hobbies or interests are, there is something for everyone at Tuscan Village. 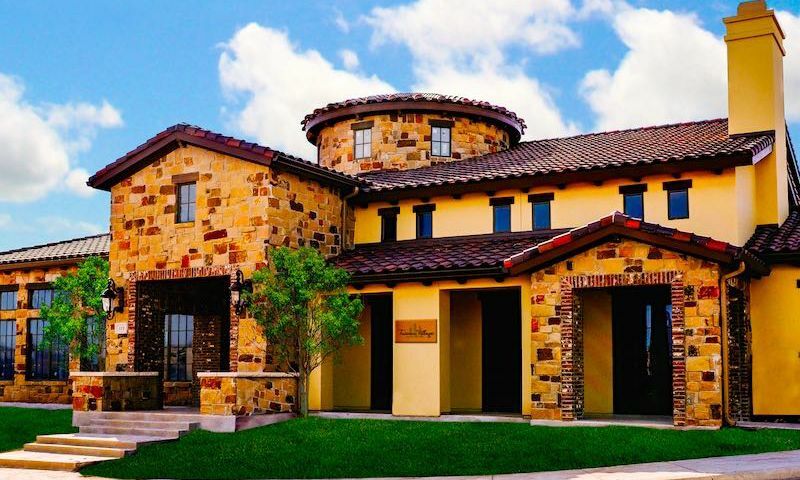 Tuscan Village is located in Lakeway, Texas in beautiful Travis County. There are restaurants, shopping centers, daily conveniences and entertainment nearby. Residents can satisfy their appetite at Hudson's on the Bend, Fore, Rocco's Grill, and The Grille at Rough Hollow. For amusement there is Bark Park, Lakeway Airpark, Hamilton Greenbelt, Lakeway Aquatics Therapy and Wellness Center, and Lakeway Activity Center. Residents can shop at Hill Country Galleria, Whole Foods and other grocers, pharmacies and countless retailers. The newly opened Lakeway Regional Medical Center is also located nearby. The Austin-Bergstrom International Airport is just 25 miles away in Austin, which also offers all of the attractions and conveniences of a thriving urban center. The attractive neighborhood setting and ideal location makes Tuscan Village an ideal active adult community in Lakeway, Texas. Clubhouse - 9,000 Sq. Ft. There are plenty of activities available in Tuscan Village. Here is a sample of some of the clubs, activities and classes offered here. There are five townhome floor plans that range in size from 1,294 to 1,790 square feet. Townhomes feature two bedrooms, two bathrooms and a one or two-car garage. Most townhomes also offer a den and an outdoor patio. For those looking for a little more living space the Villas are the perfect option. There are twelve villa floor plans offered that range in size from 1,663 to 3,219 square feet. Villas feature two to three bedrooms, two to three-and-a-half bathrooms, and a two-car garage. Most homes also feature a den and an outdoor patio. We moved in to our place here this past fall and are very pleased with everything. The community itself is beautiful and our home has attractive features. We felt that for the price, the features included were great and we also did a few upgrades to make it our own. We've got great shopping nearby and the Whole Foods is one of my favorites! The area has everything you could want in terms of restaurants, nightlife, golf and parks. 55places.com is not affiliated with the developer(s) or homeowners association of Tuscan Village. The information you submit is distributed to a 55places.com Partner Agent, who is a licensed real estate agent. The information regarding Tuscan Village has not been verified or approved by the developer or homeowners association. Please verify all information prior to purchasing. 55places.com is not responsible for any errors regarding the information displayed on this website.